Clear, reddish - golden brown in color, full bodied, sweet nose full of vanilla, sherry, and wood. Woody and nutty body, smooth, sweet and light with a dry finish, and a little spice. Minor heat in the throat with charred agave, sweet fruit, and woody aftertaste. The initial smell is of agave and perhaps something light like cucumbers. Definitely a tequila with hints of aged wood and a little sweetness. This tequila has some interesting elements in its body - it's definitely for sipping. The finish is pleasant and reminds me of the finish of a cognac. As far as enjoyability, the tequila finishes better than it starts - and that's always nice. I bought this in Los Algondonas in 2011 for 44 dollars. I guess that makes it a 100; however, I know the regular price is around 70 dollars elsewhere. My proximity to the boarder skewers my rating here - however, even so, the tequila comes bottled in one of the most recognizable bottles in the land of tequila - and to be honest, that is why I initially purchased it. Amber, with very slow tears and a pearl that stayed around until I gave it a swirl, this is a classic tequila. Bought this 1/20/10 paid $70, and I will admit, because of the "X" bottle. I waited to open because I was prepared for a disappointment... couldn't be more wrong! Sampled from a 6 oz shot glass. Color is medium caramel, leave long legs and a few tears. Nose is sweet agave/vanilla. Initial mouth feel is medium/thick and holds nice on the tongue with the oak coming through after a bit. Very smooth on the way down building in heat upon completion, leaving minimal alcohol numbing and a lingering intense earthy feel after 3-4 oz. The more I drink this the better it gets, it seems to permeate the buds and the individual flavors/body continue to build. A slightly hotter finish would be perfect, Overall a nice anejo. XQ Gran Reserva Extra Anejo NOM 1522 Tasted on 8/29/07 at 4:45pm. I tried this tequila at Zocalo in Sacramento, CA. This bottle has a unique design, being that it is in the shape of an X. With a golden color, this tequila has intense aromas of floral, caramel, and earth. Other aromas include moderate fruit, vanilla, and spice. The tequila has a medium to heavy mouth feel and on the first sip is semi sweet with a hint of bitterness. XQ Gran Reserva has intense flavors of earth, vanilla, and caramel followed by moderate to intense notes of agave and smoke. With a long duration of flavor, tastes of moderate floral and mild fruit and spice bring this tequila to a numbing finish. 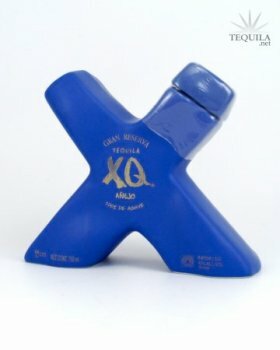 XQ Gran Reserva has received the rating of 88/89 points out of 100.